With Brighton & Hove Albion and Derby County playing their first promotion playoff match later tonight, we decided to take a look at one of (if not) the most entertaining promotion playoff finals for our Throwback Thursdays. 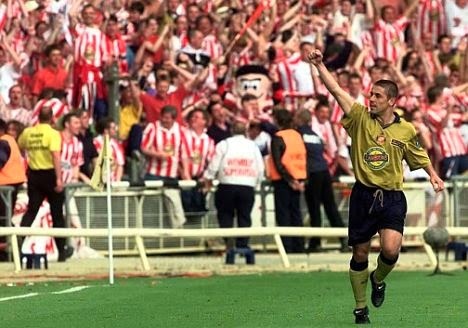 We go back to the 1997-98 season, where Sunderland finished their season in the (then) First Division in 3rd place, just 1 point behind an automatic promotion spot that was claimed by Middlesbrough. Leading up to the final playoff match, in the semis Sunderland defeated Sheffield United 3-2 on aggregate, while Charlton who finished 4th in the league had to go through Ipswitch Town to get to the final, defeating them by a score of 1-0 both at home and at Portman Road for a 2-0 final on aggregate. (Full video highlights at the bottom of the page) The playoffs final was played at Wembley Stadium in front of approximately 77,000 fans and would prove to be one to remember. The star on the day was none other than Clive Mendonca, a player who ironically enough was born in Sunderland, and would be the biggest reason why Sunderland would have to wait another year for promotion. In the 24th minute, Mendonca received a ball in the box and after a masterful flick to himself he buried the first goal of the match to give Charlton the lead. It remianed 1-0 for Charlton at the half, as the rest of the first 45 proved to be fairly uneventful. Shortly after the restart however, floodgates would open and goals would start to pour in. In the 51st Sunderland would tie the game up at 1 goal a piece, after a brilliant finish by Sunderland favorite Niall Quinn from a corner and just 8 minutes later it looked like the tide had shifted after Kevin Phillips would chip the ball into the net and give "The Black Cats" a 2-1 advantage. Charlton would not give up though, and did shift the possession and upped their playing tempo after Sunderland's second goal. In the 71st minute, a long ball would find Mendonca again and he made no mistake, with yet another beautiful first touch the Charlton striker side-footed it to put the ball in front of him on a perfect angle, and he claimed his second of the match and the 2-2 scoreline. Sunderland hero Quinn would have his own 2nd goal of the match just 2 minutes later, after chesting-down a perfect long ball into the box, Quinn volleyed his club to a 3-2 lead with less than 20 minutes remaining in the match. With Sunderland ahead by a score of 3-2 with less than 20 minutes left to play, Charlton were looking for an equalizer and a hope of at least an extra time redemption for the 3 goals they conceded. With just 5 minutes separating Sunderland from promotion, Charlton put themselves level, while the opposition supporters held their heads in disbelief. It was center-back Richard Rufus who managed to head the ball provided by a Charlton corner over Sunderland keeper, Frenchman Lionel Pérez. The match was now tied with a score of 3-3 and headed into extra time. The 30 extra minutes of football that so often provide little to no surprises in other matches, brought on more happiness and eventual misery to the Sunderland faithful. 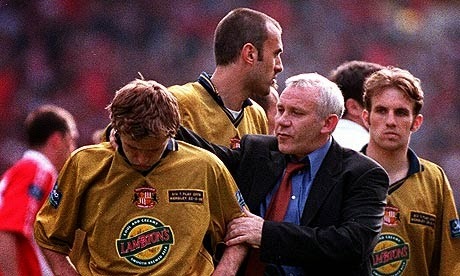 In minute 99, Niall Quinn who had already scored 2, turned provider as he slotted a good square ball to team-mate Nicky Summerbee who, after a good first touch forward put the ball in the back of the net, a goal that many on the day thought would be the ticket for Sunderland's promotion. Only 5 minutes later however, it was the Sunderland born, Sunderland raised, Sunderland AFC fan Clive Mendonca who would bring his own beloved clubs' supporters to eventual tears with a hat-trick and a goal that would take this match into penalty shootouts. In the penalty-kicks portion of this already incredible match, both squads unwilling to give up put 6 straight balls in the back of the opposing goalkeepers' net (Both star-men Mendonca and Quinn scored from the spot for their teams). The 7th attempt for both teams would prove to be the last PKs taken at Wembley that day. With Charlton going first, midfielder Shaun Newton stepped up and put the ball just over the goalkeepers raised arm and in the back of the net. All eyes were now on left-footed (and also local Sunderland kid) Michael Gray. Gray's shot to the left of Australian born, Serbian national Charlton keeper Saša Ilić was possibly the most anti-climactic way to end an amazing football display as his weak shot was oh so easily stopped by Ilić, and Charlton Athletic just like that was celebrating a promotion victory. Fun Fact: Charlton Athletic would get relegated back to the 2nd tier the following year, as Sunderland got their promotion and would play another 4 seasons in the top tier until their relegation in the 2002-03 season.